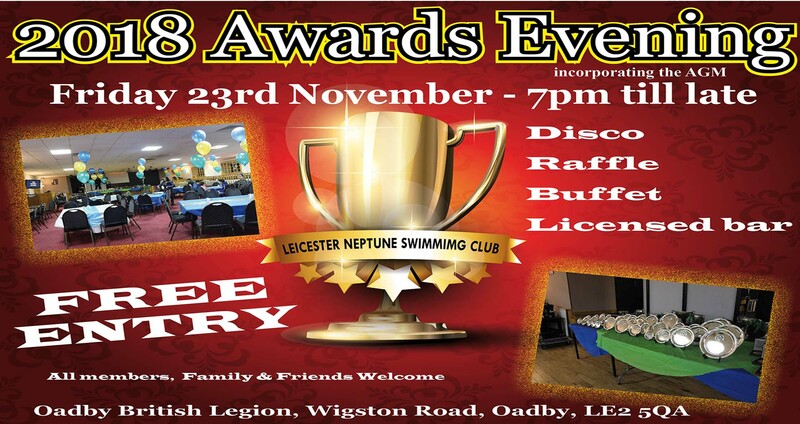 There will be no training at Evington and Parklands on Friday 23rd November 2018 due to the LNSC Presentation Evening. This autumn is going to be busy for our masters swimmer with several important competitions coming up. Firstly, the inaugural LASA Masters and Senior Championships are to be held on the 24th of September. This is a brilliant opportunity for anyone age 18 and over to have a go at swimming at a county event without having to travel outside of the county. Even better – there are no entry times, but there are prizes for placings in each ten year age group above 25 (and 18 to 25 years too). The closing date for this is coming up really soon on the 7th of September. Please let me know if you enter so that I can organise and enter the club relay teams. Entry packs are here. We really need to support this new event on our doorstep so that it runs again in future. Secondly, entries are now open for the Swim England National Masters championships at Ponds Forge in Sheffield. This meet is over Friday 27th to Sunday 20th of October. Details and entry packs are here. Thirdly, the next round of the county masters challenge is coming up at Rugby on November the 12th. Open Water Training Session – Wednesday 16th August at Mallory Park. The weather is looking good for the next couple of days so I will be running an open water coached session at Mallory Park on Wednesday evening. If you would like to take part, you must be able to swim 600m comfortably without stopping. Please be aware that this is a public session so there will be non-club members using the lake and changing rooms. The changing facilities are approx. 200m from the lake entry point so bring warm clothing to walk to the changing rooms and to go home in too. Please let me know in advance if you are coming.